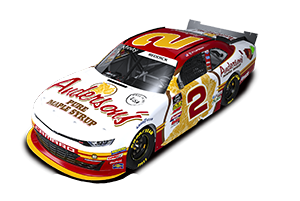 Anderson's Maple Syrup, Inc. and Nascar Camping World Truck Series team Kevin Harvick, Inc., teamed up in the Camping World Truck Series O'Reilly Auto Parts 250 on June 4th, 2011 (2PM EST, SPEED) at the Kansas Speedway, with four-time NCWTS champion Ron Hornaday, Jr. driving the #33 Chevrolet Silverado. The truck qualified extremely well, starting in the 5th place position. Shortly after the green flag dropped, Hornaday, Jr. quickly started falling back, eventually blowing a tire and wrecking on lap 17. After some fantastic work by the crew, putting the truck back together the best they could, Hornaday, Jr. returned to the track to finish in 30th place. Hornaday, Jr. sits comfortably in the top 10 in series points, currently in 6th place. Meanwhile, while all this was going on, KHI teammate and Kansas native Clint Boyer dominated the race from start to finish, helping to ease the #33 team's pain a bit by winning easily at the end. 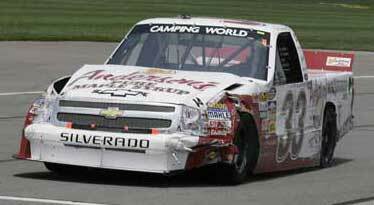 Click here to view a video of Ron Hornaday, Jr.'s wreck at Kansas.